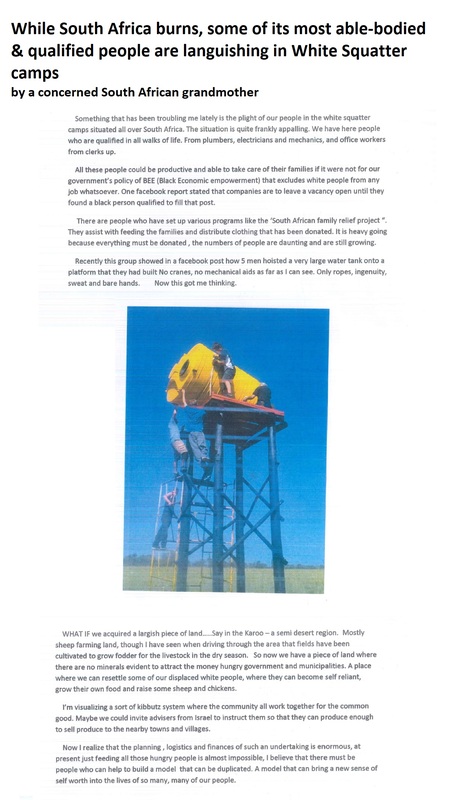 foreword by the indomitable former UKIP Parliamentary candidate, Jack Sen, segues seamlessly into feature by Afrikaner hero, Steve Hofmeyr and John de Nugent. We aren’t sure who wrote what anymore, so we’ll just credit all three great men. Enjoy! You’re not free, Virginia. Your white baas/boss gave you a job. You use his language and you write what he tells you to write. Without him, there’s nothing, as there was nothing before his descendants-my ancestors arrived. Steve Hofmeyr’s cutting, but absolutely truthful words ring as truthfully and resonate as loudly as his powerful music. Anyone arguing otherwise either needs their head examined or is doing so intentionally. Without migrants, Muslim rabble rousers, members of the gay and translesbian community, and in particular blacks, the Left have “nothing”, as Steve rightly put it, either. In fact the black man is a tool-mechanism if you wish, the ideological Left utilise to destroy western countries. He is nothing but a weaponised pawn to be used and discarded like a Soweto prostitute. He is Yossel Slovo’s ‘Mandela’, but on a societal level. Blacks mean less to these people than we do. They are a bullet to be tossed into the trash alongside the corpses of their victims. A whore to be exploited, abused and discarded once the infection’s been transmitted. That’s not hatred; just fact. And like it or not, the truth and my right to disseminate it, no matter how much it offends anyone’s precious sensibilities, must always be protected. In the following article Steve contends that the people that occupied the African continent for millennia did nothing, absolutely nothing except kill each other and plant a few mealies. No wheel, no written word, no towns, gardens, hospitals, railway lines, factories, shops or any other accoutrements of a civilization worth its salt. Just check out what the early English missionaries found when they ventured into the country’s interior in the eighteenth and nineteenth centuries. They had no political agenda and they wrote as they saw – they sketched primitive people with spears and loin cloths standing outside straw and mud houses. They wrote about their wars and their early deaths because of disease and internecine struggles. There were no title deeds then, so claiming land is now a bit hit-and-miss, given that there were no records of anything. The white man codified their languages (who else did it?) so being “oppressed” by whites is hardly the way it was. There is no proof whatsoever that these Africans would have advanced one inch without European influence. Otherwise why didn’t they create a civilization of their own? They w the territory, they had the sun, the rain, the rivers, the green pastures. Oppressed? Give me a break! I would think they should go on their knees every day that the whites came to South Africa first. But still, they’re “oppressed”, constantly rambling on about the original “black owners” of this land, the brutality of the white man etc. How can they prove they owned anything? They didn’t have the written word so no title deeds, no records, no nuttin’. Where’s the proof, Virginia? Aren’t you supposed to back up your journalistic integrity with facts? Or did your white baas tell you you can say what you like because you’re “previously disadvantaged”? So let’s get down to the basics. Every single thing you own and consume was provided to you by the whites and their civilization. You bleat about apartheid! 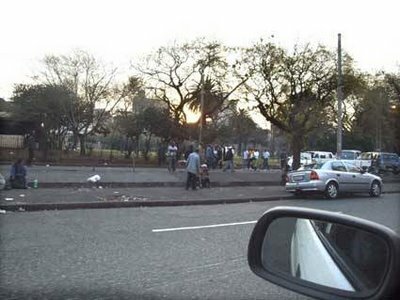 Did you ever think what would have happened to this country without apartheid at the time? As the post-war hordes streamed into the cities looking for work (they can never create work, someone else must give them a job! ), where would it have stopped? Our cities then would have become like our cities today, only fifty years earlier! We would have been sitting with a Kwame Nkrumah or a Jacob Zuma fifty years earlier, with all that this implies! Where did Eskom, Sasol, Iscor, our nuclear achievements and one of the world’s most vibrant economies have come from except under apartheid? Unshackled by the huge drain of a welfare state (as we have now), white creativity and entrepreneurship flourished. Did you know that the rand was worth more than the US dollar at that time, that investors streamed into our country because the non-Zumas were in charge? That millions of blacks to the north of us tried to get into the apartheid pariah country? Like so many of your ilk, you call the truth racial hatred. Well, the whole world must be practising racial hatred because they do all in their power to keep blacks from Africa out of their countries. Why do you think the Australians won’t let aliens even touch their shores? Why are the Italians and the French and the Greeks complaining about too many blacks in their countries? 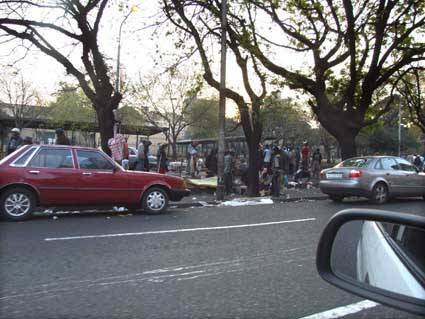 Check out Israel’s policy towards blacks: they are deported en masse and attacked in the streets of Tel Aviv. Why is this? 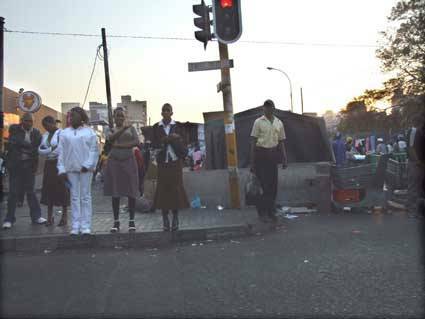 There are reasons, Virginia and they can be found in the streets of our once pristine South African cities. The fact is that when the blacks move in, the whites move out and this happens all over the world. (Detroit is now filing for bankruptcy for this very reason). I just loved your “we are twenty years into democracy, into freedom” platitude. Democracy? You’ve got to be kidding! 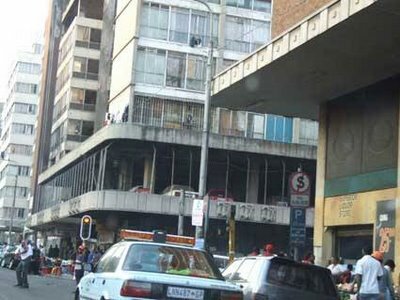 When the country is run from Luthuli House, where not one parliamentarian is responsible to any constituent, and where the so-called government is the worst the country has ever had, there’s not much to be said for democracy. And freedom? Freedom to do what? Pee against someone’s wall? Throw rubbish into our once clean spruits? Murder someone for a cell phone? Live in crowded shacks in a squatter camp because you were “free” to come to a city with no job for you? So that’s freedom is it? You’re not free, Virginia. Your white baas gave you a job. You use his language and you write what he tells you to write. The “verkrampte regses” [JdN: “the rigid right-wingers”] are right. Democracy and freedom screwed up big time! You ask Steve to “pak op en trek” [JdN: “pack up and leave”]. Why don’t you do this if you’re not happy with the white man’s legacy to this country? How about looking for a job in Zambia? Or Rwanda? Hey, what about Liberia, home of Ebola! This is the country comprising slaves repatriated from the United States. The country has been financed and supported by America ever since – the US couldn’t get them back to Africa fast enough! Liberia has freedom and democracy too, but they don’t even know how to wash their hands. There are no whites in Liberia, and that’s the difference. Why don’t you go there and you won’t have to put up with people like Steve? You talk about being “onderdruk” [JdN: “oppressed”]. Yes, there was law and order and you couldn’t just go into a park and defecate and throw your papers all over the show and leave your takeaway mess under a seat. Which park do you take your children to now, Virginia? 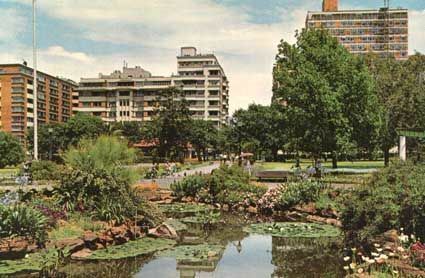 Remember Joubert Park in Johannesburg? Christmas was a wonderful time – the lights, the theatre shows, the decorations. 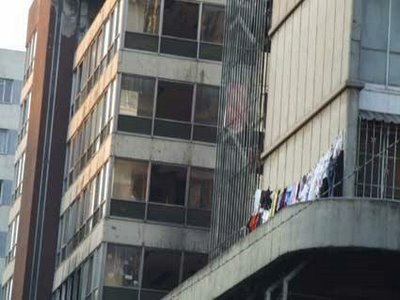 Now it is home to Somali squatters who live there, and hang their washing over the trees and use the gutter as a toilet. Was it better under apartheid, or worse, Virginia? Now that the park is for everyone, who wants to go there? All pictures taken from the Twist Street side. 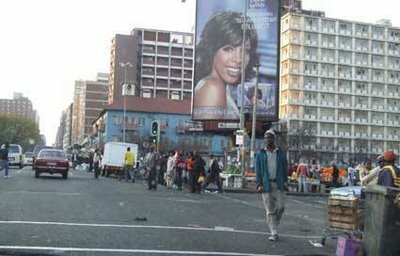 What was wrong with control under apartheid? Sweden for example didn’t have apartheid because it didn’t have third world hordes. Now our cities are ringed with squatter camps. (I bet you live in a gated community, or if not, your windows are barred and there’s plenty of “security”. Security against whom, Virginia? Whites? No my dear, security is against the “freedom of movement” you so like to punt. Steve doesn’t “staan alleen in die land” [JdN: “stand alone in this country”]. Not at all. Millions agree with him, millions. They just don’t say anything. 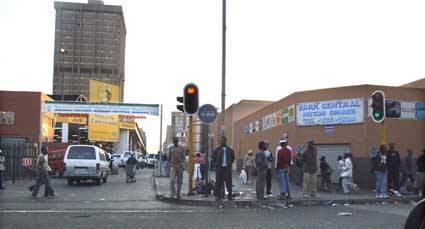 But they curse as they drive through Sunnyside in Pretoria, once a pleasant flatland with parks and nice shops. 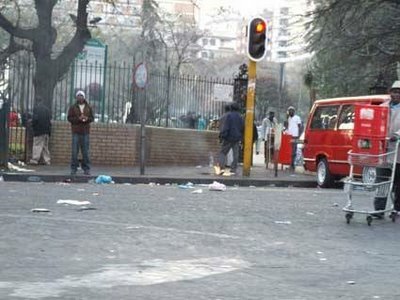 Now the rubbish is on the streets, not in bins. 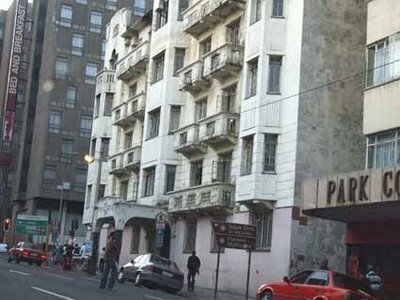 The prostitutes roam from corner to corner, waste is tipped out from flat windows and no one in their right mind would be seen dead living there. The Sudanese and the Somalis have it all to themselves. So was apartheid so bad, or is this better? Better for whom? And Hillbrow? It’s not called Little Lagos for nothing. 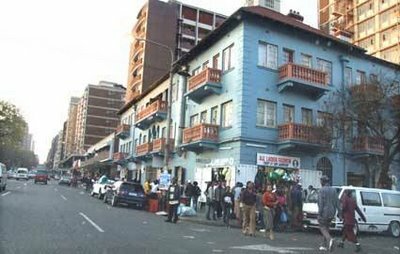 If you feel free, just go and rent a flat there and then you’ll realize why there was apartheid. 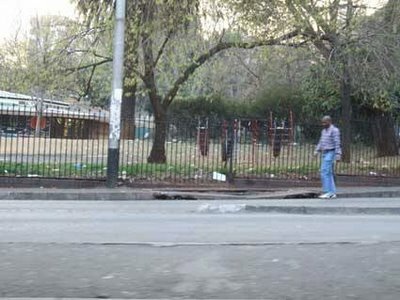 You say footpaths were only for whites? I never saw that. People could walk where they wanted in public places. There was no “one side for you, one side for me”. Where did you see that, Virginia? You can’t have it all in South Africa, Virginia. You ask how it feels to experience this and that. Does it not worry you that we experience things that are a hundred times worse than not being able to go into someone’s restaurant? What about the vicious crime? What about the wanton killing and torturing of farmers? 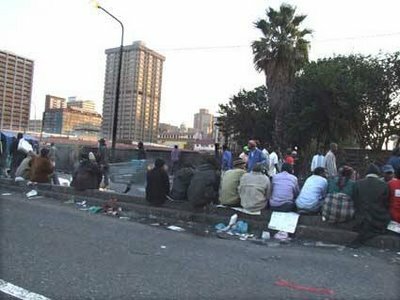 What about the unemployment and the terrible poverty, much worse than under apartheid? What about the corruption in government? Who is stealing us blind? The whites or the ANC? Who has destroyed productive farms in their hundreds in order to prove a failed policy? Who is putting food security at risk? The whites? Who has turned our once world class health system into a third world disgrace where babies die and patients have to buy their own anaesthetics and medicines because the hospitals have run out? The whites? Who doesn’t answer the phone, doesn’t reply to letters and generally doesn’t give a rat’s backside for the people who pay their fancy salaries? 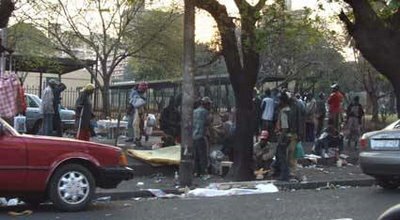 The ANC’s comrades occupying jobs for which they are not qualified, or the Whites? Who are “deployed” somewhere else when they’re found with their hands in the cookie jar? White employees or the others? Your freedom-and-democracy people can’t even run a post office, Virginia. They can’t keep the country in electricity, and they can’t run the Johannesburg Zoo, let alone protect our wildlife. They let their animals starve on farms they were given on a plate by their pals in the government. They are unable to produce books for school children. They steal from their own children’s school feeding schemes. They steal from the social grants (read welfare payments) destined for poor old people in the homelands who stand all day to get their money. 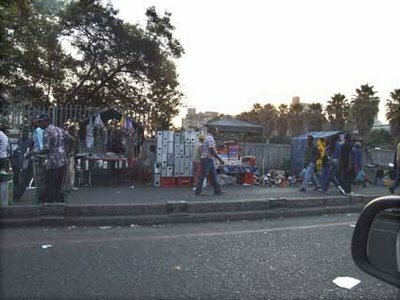 Warning that South Africa is sitting on a “powder keg,” Archbishop Desmond Tutu argued that Black Economic Empowerment only serves a few black elite, leaving millions in “dehumanising poverty”. They need BEE because they can’t even start a spaza shop in the township. They rob and assault the Somalis and the Pakistanis who do start them. They are a disgrace and you would do well, Virginia, to concentrate on this cancer eating away at a once beautiful and prosperous country. Don’t worry about apartheid, Virginia, or Steve either. There’s much worse on the way to focus your mind. Concentrate on crime, and our window bars and our alarms and our palisade fences with the spikes on top. It’s amazing how many commentators say that crime affects the blacks “as well”. But when there were whites-only areas, there was hardly any crime. 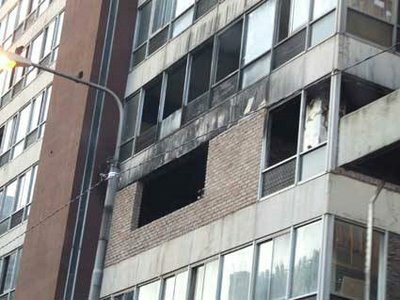 This is why there were no bars on windows, no townhouse complexes (for security! ), no boom gates to keep who out? Whites? No, blacks dear Virginia. When they were not there, there was virtually no crime. So put up or shut up. Concentrate on bringing to book the criminals (both government and freelance), and leave Steve alone. He’s telling it like it is, and so should you. 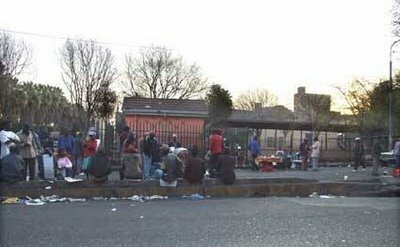 Ask those venal creatures in the ANC to move to black residential areas, to send their kids to black schools, to use state hospitals, to go to black doctors and to buy their clothes in Soweto. The sins of apartheid are pisswilly compared to the wholesale pillaging of our country by the charlatans calling themselves the government of South Africa.